With lengths of 90-130 mm and an angle of +/- 6 degrees (flip/flop), the engage ST-6 can be used in all disciplines up to a rider weight of 100 kg. Due to the 43 mm high clamping area on the steerer, we achieve a positive and secure load distribution. The 40 mm wide handlebar clamp allows gentle mounting of the handlebar and also provides a perfect power transmission. The front face plate features an angled tightening in order to also be accessible when using "FrontOut" computer mounts and to not also having to dismount one's computer mount e.g. for transportation. 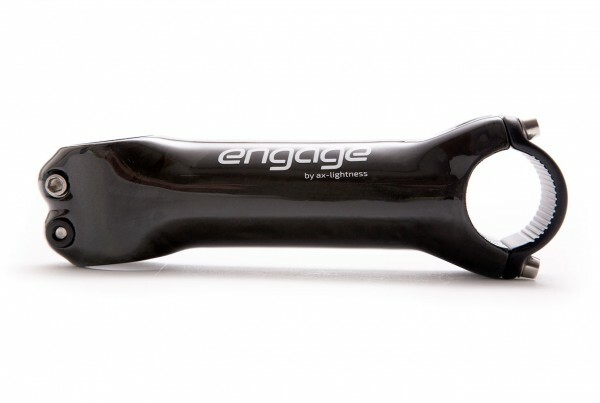 At a length of 100mm, the engage ST-6 just brings is to 122 grams and that with best stiffness values! Customer evaluation for "engage carbon stem ST-06"